There’s a good chance that you have never heard of Simon Oxley. Unlike his most famous creation, the original Twitter logo, this UK-based graphic designer doesn’t hog the limelight, preferring instead to let his work, which he rather modestly describes as “playful, graphic, illustrative… and hopefully fun for people to look at”, do the talking. He downed tools to answer my questions for Jumpstart Magazine and explained a little more about his work, his motivation and that famous design. With a lifelong love of drawing and modelling that began as a child, it was inevitable that Simon would eventually end up capitalising on his talent, and after finishing his Diploma in Graphic Design, he worked for a variety of small marketing firms in the UK. During these years he honed his skills with an Apple Mac, something that would prove invaluable in his later career. In 1999, Simon relocated to Japan to be with his future wife, and that’s when his design career really began to take off. A casual meeting with the brother of a friend resulted in a role at Insentiv Media, a Tokyo-based web and print design company whose buzzy Harajuku location proved inspiring. Simon explains, “This gave me my first real experience of working alongside coders and a variety of colleagues from all over the world, it was a real United Nations of multimedia and design”. He continues, “My principle task was to produce visuals for corporate annual reports and this enabled me to enter the inner sanctums of some of Japans biggest corporations, such as Mazda, KDDI, Kyocera, Yamaha Instruments and more”. After three years in Tokyo, a move back to the UK with his pregnant wife enabled Simon to continue working with his Japanese clients, while picking up some British freelance contracts, but his now-famous royalty-free image work began to really take shape after the young family returned to Japan in 2003. “I began designing icon and character sets to upload to iStockphoto.com, and as sales increased, I was spurred into a state of manufacture, each day religiously uploading photographs I had captured in Japan while on trips with my family.” Before long he had amassed a sizeable catalogue of royalty-free images, which were generating sales, but also introducing him to the wider, supportive design community. “Contributors would give feedback and generally share comments on a wide variety of subjects through the forums”. It was from iStockphoto.com that a newly-launched online social networking company called Twitter picked up on his distinctive style, deciding that one image in particular would be a good fit for their brand, “I recall spending a couple of hours making the bird shape while producing several icons in the same style.” explains Simon, “At that time I was interested in geometric shapes inspired by Japanese traditional crests and company logo marks, which often are constructed in a highly technical manner”. Although Simon made just a few US dollars from Twitter’s use of his bird design, he remains resolutely proud to have been involved, in however small a capacity, in the company’s enduring success. As far as the image’s impact on demand for his work goes, he explains that although the exposure has brought renowned interest in his services, from time to time potential clients, not realising that his work with Twitter wasn’t directly commissioned have assumed that his fees are now beyond their budget. But despite this misconception, Simon’s work continues to grow in popularity, with open-source software host Github also picking up another iconic design: the Octocat. As with the Twitter bird, Github picked up the original Octocat design for a small fee back in 2006. It has since become something of a cult classic, much loved by tech insiders, with Octocat enthusiasts devoting hours of effort into reworking the original into new guises. Far from feeling possessive of his cat, Simon gives the fan-created incarnations his full seal of approval; “I was recently sent two, five-inch high Octocat vinyl toys, along with a fistful of stickers featuring many of the versions made by their users. I tend to like the robot versions, but can find interest in almost all of them”. So with two globally recognised logos now under his belt, how does Simon hope to top his previous successes? The answer is a further embrace of new technology, collaborative working, and more quirky icons for us to warm to; “I’m keen to promote products that carry my designs, so I hope to make use of 3D printing technology to collaborate with firms keen to develop fun toys”. Potential clients evidently also recognise his strength in creating fun and recognisable characters that people engage with, and Simon has experienced an increase in requests for company character mascots, explaining, “Tech firms want to create a brand based around a personality that they and their users can get behind”. Having seen the successes of both the Twitter bird and Octocat, this seems like an extremely sensible strategy, and one that will hopefully see Simon’s designs continue to travel the globe, developing cult followings of their very own. Q: How should startups go about developing their logo? 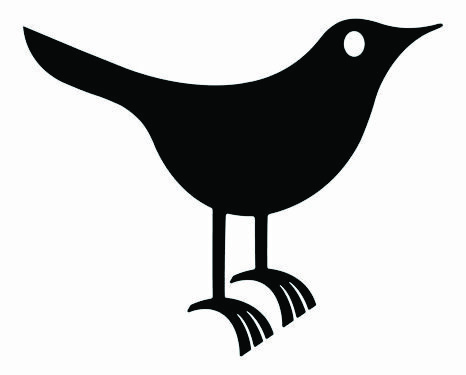 Start up firms sometimes employ a friend or make it themselves – Twitter used my bird image available on iStockphoto, but stated that it was used as a pictorial graphic alongside their text based logo. Some designers negotiate a stock option in the company for perhaps a limited duration of say 3 yrs trading, this means payment never exceeds affordability. In my experience though, charging a reasonable one off fee tends to be received more readily. Q: How much money should a startup spend on their first logo? The amount may depend on any backing they may have received. Often firms begin with a logo, but no real brand image, which becomes realised as their confidence and income grows. Q: What inspires you when creating a new logo? New clients often refer to existing logos they like, I have recently been making mascots to add some personality to the brand. I generally arrive at a logo through sketching pencil and paper, then send ideas and discuss options with clients from there – honing the personality to a defined point. Q: What are your favorite logos? I view so many good logos on the likes of Pinterest, so deciding on a few is very challenging – I like retro brand images such as ATARI and Japanese model company TAMIYA – I like Golfing brand PING – NIKE and ADIDOS – lots of Japanese food brands etc. I am a fan of Saul Bass, who designed IBM and Minolta and a lot more besides – I was lucky enough to attend a lecture given by him at my college in the UK back in 1988.